After such a successful season last year, the Drexel University men’s wrestling team looks to dominate once again. It is going to be hard to keep up with their 12-4 record from last season, where they were 6-4 in the conference, but a doubleheader in the Daskalakis Athletic Center was the perfect return for such a strong team. The first match of the day Nov. 4 was against Keystone College, which is coached by former Drexel standout wrestler Steve Mytych. The Dragons were granted wins by forfeit at 125, 133, 174 and 197 pounds, and won the rest of the matches. Sophomore Julian Flores had a first-period pin on Colby Bronzburg at 141 pounds. Sophomore Trevor Elfvin took 19 seconds into the second period to pin Jason Jones for the win at 149 pounds. Sophomore Evan Barczak had a 22-7 technical fall win over Thomas Michaels at 157 pounds, while junior Ebed Jarrell pinned Alex Talanca in the first period. To finish the match, junior Owen Brooks pinned J.J. Hooper in just 31 seconds, and redshirt senior Joey Goodhart pinned Cameron Smith at heavyweight to give the Dragons the 59-0 win. The next match was against Wheeling Jesuit University. Freshman Ty Smith started the Dragons off with a 11-2 major decision at 133 pounds. Drexel lost matches at both 125 and 141 pounds, putting Wheeling in the lead. But, this is when Drexel really kicked it into high gear. Elfvin had a 9-4 decision over Tyler Alberts at 149 pounds, which was followed by a 22-7 technical fall win by Barczak at 157 pounds. The Dragons had back-to-back major decisions at the 165 and 174 pound weight class by Jarrell and redshirt freshman Bryan McLaughlin, who won 10-2 and 13-5, respectively. 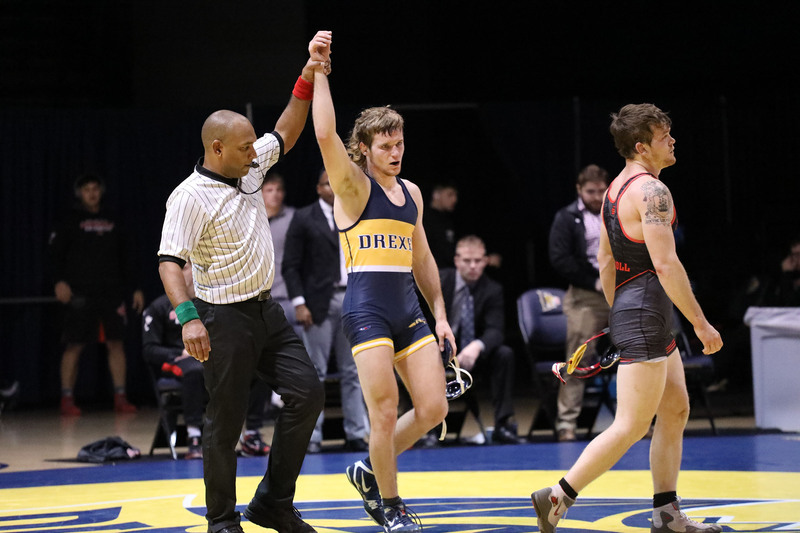 Drexel lost the 184 pound match, but came back to win the 197 and heavyweight matches: senior Stephen Loiseau had a 18-0 technical-fall victory over Dalton Hoover, and Goodhart outlasted against the reigning Division II champion Terrance Fanning. This gave the Dragons a 28-9 win over Wheeling, while Wheeling won their match over Keystone. Drexel will have their next match Nov. 10 when they face The Citadel, Purdue University and the University of Nebraska.